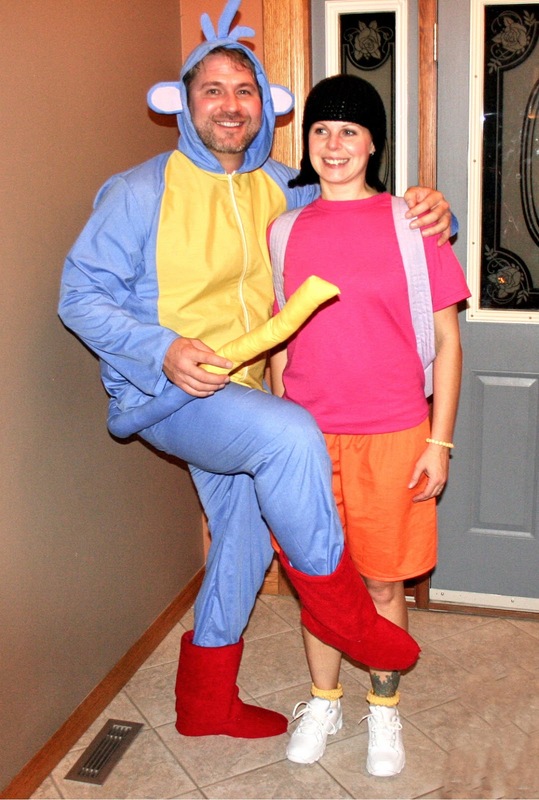 My husband and I were attending a Halloween Party on the weekend, so we had an excuse to get new costumes this year. I struggled with ideas. I like my costume to be economical and not thrown together (although I have done this in a pinch). My kids don't like to see us dress scary and they really don't like to see us dress gory. 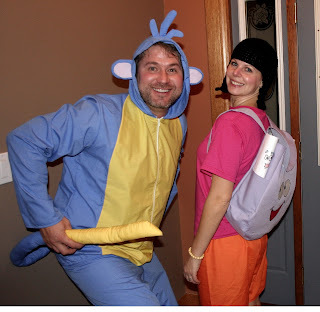 I cannot dress in an adult themed costume because that is something I am not willing to explain to the kids, so I was left searching for ideas. 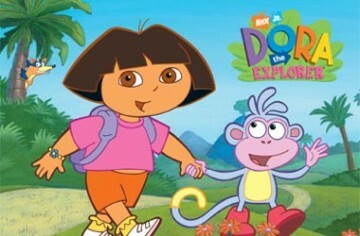 Finally, I stumbled across Dora and Boots and went with it. 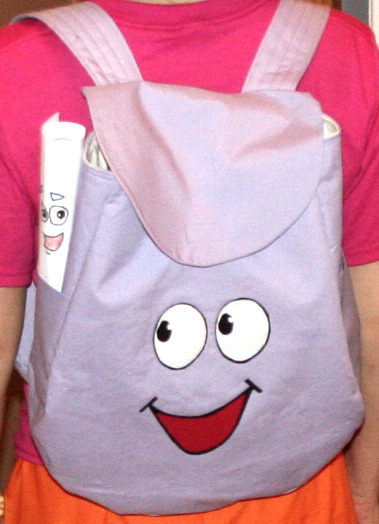 My favourite part of the costume was backpack. I made the eyes and mouth in black, then cut the white of the eyes and the red of the mouth smaller. They are fused together with fusible interfacing then stitched down. I couldn't find a pattern, so I just winged it. My son drew maps face and coloured it for me. He did a great job! I love it. I hope my kids will play with it after Halloween. My wig is crocheted. I found the pattern on ravelry - an awesome place to find crochet and knit patterns, you can also get it here. I learned a new stitch, and it is the first hat I have crocheted that came out the right size, the first time. Awesome. I discovered that yellow socks are very hard to find, so I used crochet again to add a yellow ruffle to the top of a pair of ankle socks I already owned. The boots costume was scary for me. I get worried when I sew things for my husband. Larger clothes are harder to make then small clothes, at least for me. I used a pattern for the pants and for the top I made my pattern pieces from one of his shirts. I had just sewn my first hood when I made my daughters little red costume, so the hood went well. The boots are constructed over a pair of slippers. I am so happy that it fit him! We went out and had a great time. Home too late, but it was fun. I apologize for my writing, I am not a writer to begin with and today with lack of sleep and a fuzzy brain I feel a little disjointed, but I wanted to share the last of our costumes. Happy Halloween and Happy Birthday Hubby! !